CAM350 streamlines the electronic product delivery process by verifying and optimizing a PCB design for fabrication. CAM350 is easy to learn and use, and its return on investment is instantaneous. CAM350 gets PCB designs successfully through fabrication with ease - the first time. Many electronic design organizations now recognize that problems arising during PCB fabrication can drastically impact product schedules, cause costly design re-spins, and require modifications to the design after release from engineering, compromising design integrity and intent. Inspecting, preparing and validating the PCB design prior to release to manufacturing will result in a significant increase in efficiency, less risk of design re-spin, and, most importantly, successful electronic products, built faster, at less cost. CAM350 will automatically import your CAD database or you can choose to import Gerber files. It will then use Netlist Compare to verify that the electrical characteristics of the Gerber layers match the design intent. Errors can occur in translation, operator mistakes, accidental inclusion of non electrical items in Gerber output, and problems with manual separation of voltages on a plane layer (2d lines on CAM plane in PowerPCB for instance). Netlist Compare will graphically match up original design files with Gerbers to ensure accuracy by locating any disparities. CAM350 also offers Design Rule Checks (DRC) to verify the Gerber layers match not only the design rules in your CAD system, but the capabilities of your fabricator as well. CAM350's Design for Fabrication (DFF) tools insure the board not only matches manufacturing capabilities, but also searches out design flaws that may affect yields resulting in missed deliveries and delayed product release. DFF can also detect failures that may escape traditional electrical verification. 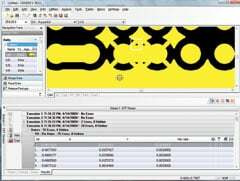 CAM350’s Design for Fabrication (DFF) Analysis pulls fabrication rules into the PCB design domain and presents them in a way that is understood by the PCB designer. DFF Analysis verifies the PCB database, while still in engineering, seeking issues that may cause problems when entering into the fabrication process. Consult our sales representatives to assist you with configuring the solution that best fits your needs. 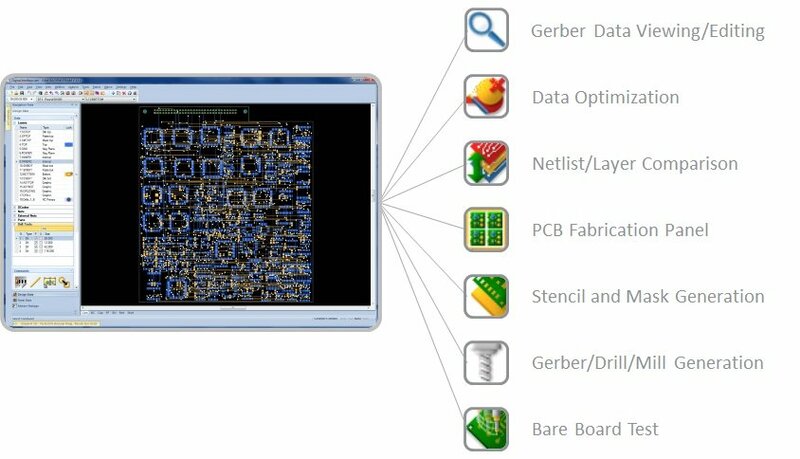 CAM350-115 - has the functionality to import, modify, optimize and analyze your PCB design data to ensure timely, high-quality PCB fabrication.Features and FunctionalityCAM350 functionality includes:• Import of standard file formats including Gerber, ODB++, IPC-2581 and others• View, query, report or measure almost any construct in the design• CAM editing to add or modify flashes, pads, polygons, lines, text or add teardrops• Netlist compare and export to IPC-D-356 and other formats• Convert draws to flashes, drawn polygons to rasterized polygons• Remove redundant data and clip silkscreen ink away from pads• NC editing to add or modify milling, mill tabs and drills• Custom aperture editing to create custom pad shapes or custom polygonal areas• Design Rule Checking (DRC) to check for minimal spacing errors, minimal annular rings, minimal feature sizes, and other anomalies• Panel editor to design custom fabrication panels• Export functions to package your completed design in standard manufacturing formats including Gerber, NC Drill and Mill and others• Macro based application automation for command record and playback.